Editor’s note: This is something from the inbox which you should put on your calendar, as well as on your list of events to sponsor in 2014. It’s for a great cause and features some great entertainers. Contact my friend Valentina Estrada (contact info at bottom of post) for sponsorship opportunities. 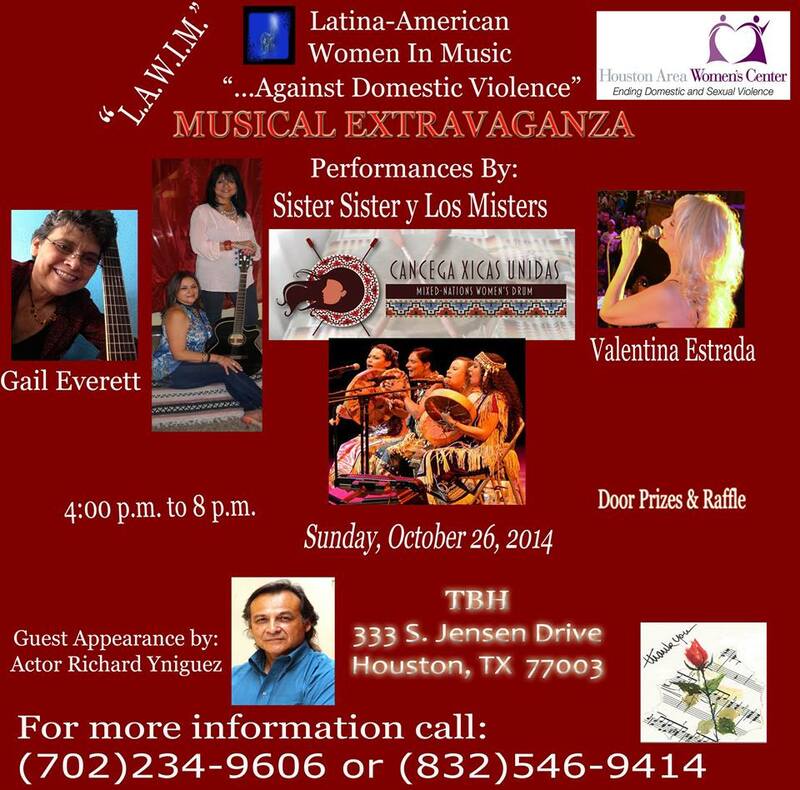 You are cordially invited to be part of a “Musical Extravaganza” at The TBH Cultural Arts Center, 333 S. Jensen Drive, Houston, Texas 77003 on Sunday, October 26, 2014 from 7 pm To 10 pm in support of battered and abused individuals. The Musical Extravaganza is being organized by Latina-American Women In Music (“L.A.W.I.M.”) sponsored by companies and concerned individuals that desire to see a change. In addition, many community leaders, organizations and entertainment icons will be at this tremendous event to seal their commitment to support “L.A.W.I.M.” and offer their extraordinary talent and resources to this cause. Their enthusiasm and influential participation in the Latino community has inspired many to achieve higher goals and we are honored that they have committed and pledged their time to participate! This Musical Extravaganza is expected to be a sell-out and be of great magnitude and become an historic event in Houston. In joining us in this charitable aim your affiliation and presence includes you as a part of making a difference and change in our world. Proceeds from this event will be committed and used for the specific purpose of helping a Women’s Shelter to reach out and help battered and abused women in our community where the help is much needed and be of support of future events for various causes. “L.A.W.I.M.” has committed to continue the fight for human rights! Your sponsorship and participation with this human rights event will have a real effect on lives in our communities. Please join us on this evening of great purpose; it will have a lasting impact! We are thanking you in advance for your support and contribution. For further information, please feel free to contact us! This entry was posted in Accion, Cultura, Historia, Las Mujeres and tagged houston october 26, johnny hernandez, latina-american women in music, richard yniguez, talento bilingue. Bookmark the permalink.